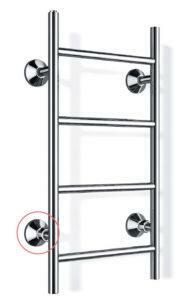 All water heated REJ Design Tango, Largo, Bamboo, Domo, Tredo and Vivo towel rails come with factory-installed cover flanges in mounting feet (2 pcs). Flanges are also delivered with Duetto model. The outer dimensions of the cover flanges match those of Oras eccentric and straight coupling flanges, and are also compatible with surface-mounted angle couplings. 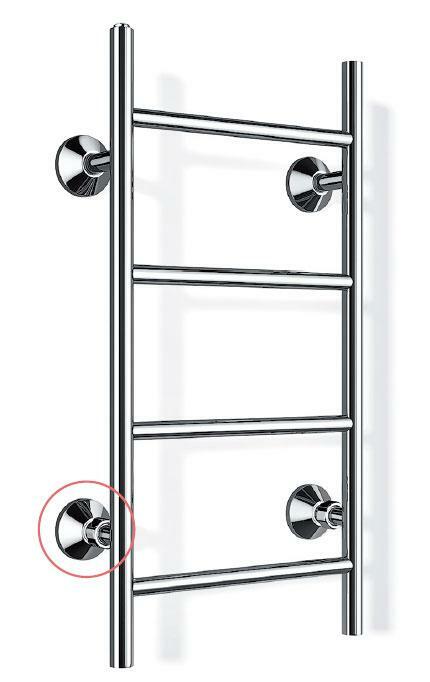 No screws are visible when the towel rail is mounted, and the mounting is unobtrusive and stylish. 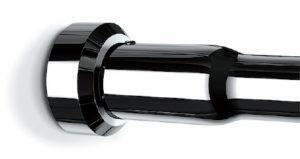 When flush-mounting a water heated towel rail, we recommend that original Oras eccentric or straight couplings are used (R 3/4″ male thread, 45 mm from the wall to the outer surface of the thread). 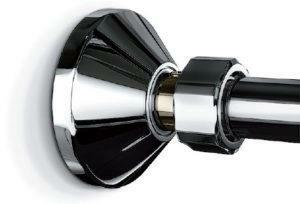 Water couplings are not included in the towel dryer package, but they can be delivered upon request. See accessories. 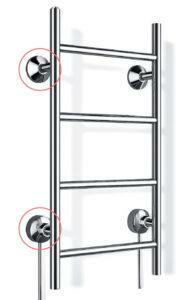 HVAC professionals who install hot water operated towel warmers usually have the couplings required. However, we recommend that, when placing an order for a towel rail painted in a special colour, the water couplings are ordered at the same time to ensure that they come in the same colour as the drying rack, for a neat result. We always recommend using an HVAC professional to install hot water heated towel dryers. 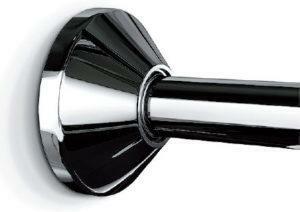 When surface-mounting a water heated towel rail, we recommend that original Oras surface-mounted couplings are used (R 3/4″ male thread, 45 mm from the wall to the outer surface of the thread). 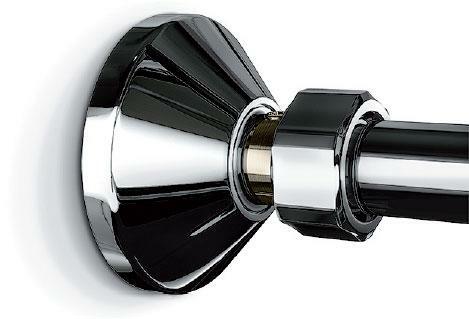 Water couplings are not included in the towel dryer package, but they can be delivered upon request. See accessories. HVAC professionals who install hot water operated drying racks usually have all the couplings required for the installation. However, we recommend that, when placing an order for a towel rail painted in a special colour, the water couplings are ordered at the same time to ensure that they come in the same colour as the drying rack, for a neat result. All water heated REJ Design drying racks are suitable for installation in domestic hot water supply and heating systems. The towel rails can be either surface-mounted or flush-mounted. 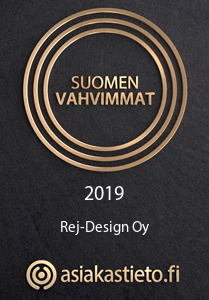 REJ Design drying radiators are compatible with the water couplings generally used in Finland, such as Oras couplings (see above). Water couplings are not included in the product package because the installation method depends on the installation site. We recommend that an HVAC professional installs water heated towel rails. The cover flanges (2 pcs) for the mounting feet of water heated drying racks are standard equipment in Tango, Largo, Bamboo, Duetto, Domo, Tredo and Vivo series. 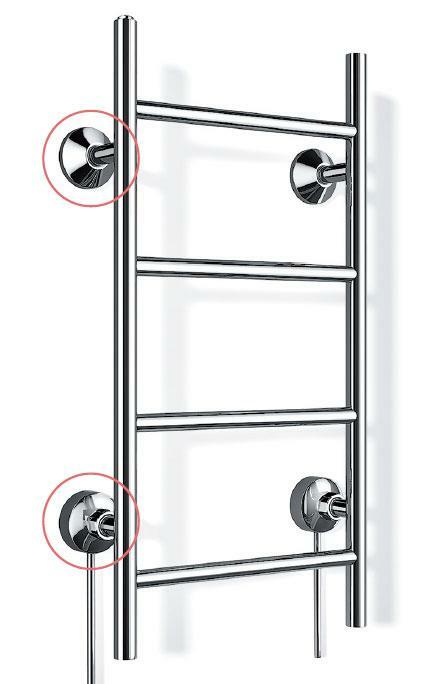 Most of the standard models of water heated REJ Design towel rails have a bottom connection with different connection distances (water couplings from lower feet). However, our water operated product range also includes many other connection options. See examples of our drying rack models with side, top and special connections below. 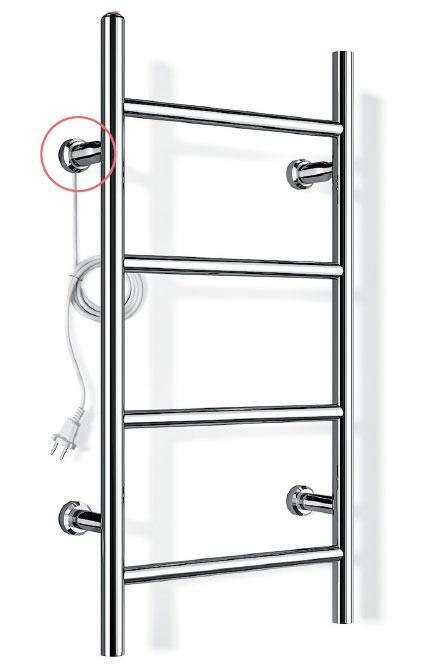 The adjacent image shows a water heated Tango BTH 35744 towel rail with a bottom connection hooked up to a domestic water supply or heating system using Oras surface-mounted couplings (not included in the product package). Surface-mounting is used when water pipes have been installed on the surface of the wall structure or when the drying rack is to be retrofitted to the domestic hot water supply system. 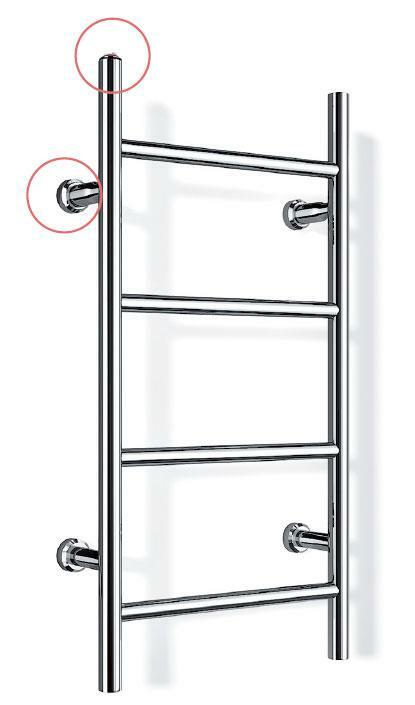 The adjacent image shows a water heated REJ Design Tango BTH 35744 towel rail with a bottom connection flush-mounted using Oras eccentric or straight couplings (not included in the product package). Flush-mounting can be used when water pipes have been installed inside the wall structure and the outputs have been designed and installed to be suitable for the specific drying rack’s connection distance. The water pipes will not be visible. 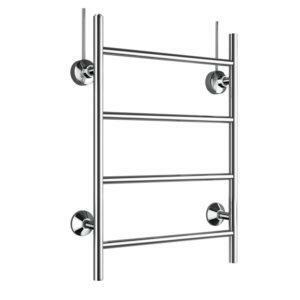 Specific REJ Design hot water heated towel rails come with a standard side connection (e.g. Largo BTH 120404; Largo BTH 80404; Largo BTH 60404; Smart BTU 602, 602S, 502, and 402; and Smart BTM 660). The drying rack is connected to the domestic hot water supply or heating system from the side (couplings are located one below the other on one side of the drying rack). Check the connection distance in the product specifications of the specific product. 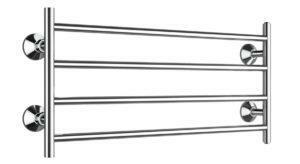 Towel rails with a side connection are equipped with two bleeder screws, allowing them to be connected either from the right or from the left. Other models with a side connection can be manufactured to order, for example, in place of a flat-panel radiator. If required, we can also manufacture water-heated drying racks with a radiator valve connection (R 3/8″ connection from the end or the side of the bar). Ask our sales service for more information, tel. +358 9 8689 390. In addition to drying racks with a bottom or side connection, specific models are also available with a top connection. The water coupling of standard REJ Design models with a top connection comes from the top feet, allowing the final product to be as neat and stylish as possible. Towel dryers with a top connection are excellent for renovated sites where water pipes are installed in or below the ceiling. 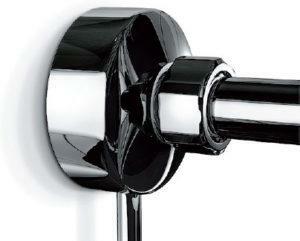 As a result, the surface-mounting of water pipes can be minimised. An example of the installation of a water heated drying rack with a top connection is shown here where water pipes have been installed on the surface of the wall structure (Tango BTH 50744 with a top connection is shown in the photo). 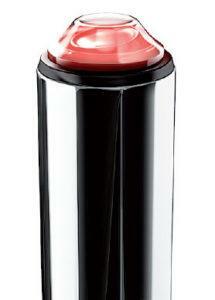 Models with a top connection include Tango BTH 35744 top, BTH 50744 top, BTH 60744 top, 50514 top, 50655 top, 40788 top, 50788 top, 40807 top, 35130 top and 50130 top. We can also manufacture other drying rack models with a top connection to order. 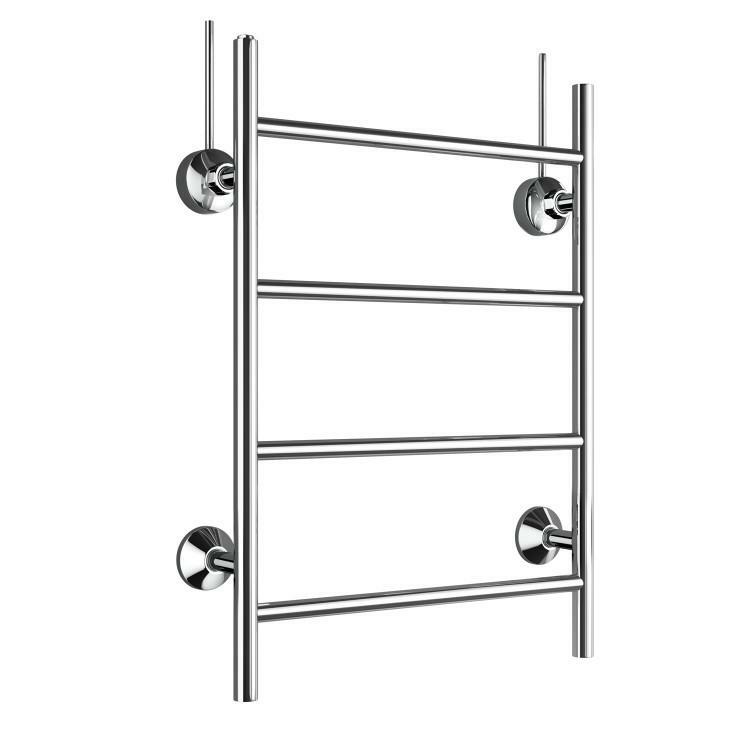 If required, water heated towel rails are also available with a radiator valve connection (R 3/8″ or R 1/2″, connection from the end of the bar). Ask our sales service for more information, tel. +358 9 8689 390. 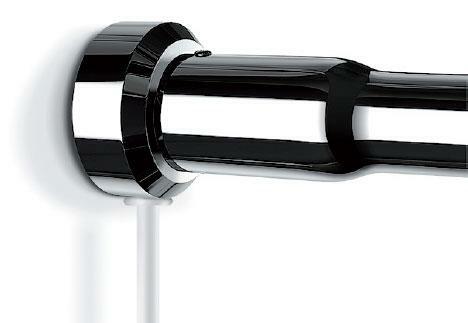 Electric REJ Design towel rails are delivered with a plug connection. The standard length of the power cord is 130 cm. Upon request, we can also equip the product with a 400 cm cord (ask our customer service for more information). The towel rail is ready to be connected to an electric socket. Authorised electric contractors can also install the towel dryer as a fixture with the cord hidden. In a fixed installation, we recommend that the power cord of the device is used together with an electrical installation tube of at most 16 mm. The location of the power cord and the diameter of the lead-through should be considered at the planning and construction stage of the building/room. The diameter of the mounting flange of an electric drying rack is 43 mm and the thickness of the power cord is 8 mm. The easiest way to build a fixed installation is to make preparations at the construction stage. An installation tube dimensioned for an 8 mm power cord should be installed underneath the mounting flange in the mounting/connection point (maximum diameter of the installation tube 16 mm so that there is enough room for the flange fixing screws). The electric drying rack has an unobtrusive on/off rocker switch equipped with a signal light at the end of the bar, in the same corner as the electric connection. The towel dryer handedness can be selected when placing your order (see product specifications). 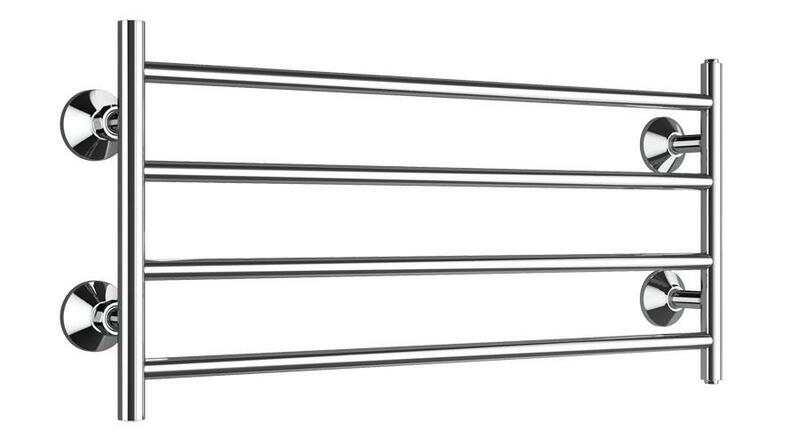 The r/t, l/b marking in the product specifications of electric drying racks means that the power cord comes from underneath the right-hand top foot and the on/off switch is located at the end of the vertical bar in the right-hand top corner (Tango, Largo drying racks) or at the end of the horizontal bar (Bamboo). Because REJ Design towel dryers have been manufactured using the dry resistance technology and they do not contain any liquid, the drying rack can also be installed the other way around, when the cord and switch are in the left-hand bottom corner. Correspondingly, the l/t, r/b marking means that the model has a left-top/right-bottom connection. All electric REJ Design towel rails are delivered with a plug connection. The length of the standard power cord is 130 cm. Upon request, we can cut the power cord to a specific length or deliver the drying rack with a longer cord of 400 cm. For example, in Tango and Largo models, the power cord comes from underneath the right/left top or bottom foot according to the selected handedness. The drying rack is ready to be connected to an electric socket. Wall mounting is quick and easy. Authorised electric contractors can also install the towel rails as a fixture with the cord hidden. In a fixed installation, we recommend that the power cord of the device is used together with an electrical installation tube of 16 mm. The drying rack model and the requested installation method and location (e.g. power cord location, lead-through diameter) should already be considered at the design and construction stages so that the final product is neat and stylish. 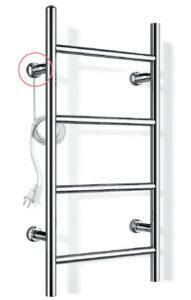 The electric REJ Design towel rail has an unobtrusive on/off rocker switch equipped with a signal light at the end of the bar, in the same corner as the electric connection. The drying rack handedness can be selected when placing your order (see product specifications). The adjacent photo shows an electric Tango EH 35744 l/t, r/b drying rack in a fixed installation and the power cord hidden. The installation is elegant and unobtrusive. In a fixed installation, we recommend that the device’s power cord is used, and the location of the power cord and the diameter of the lead-through are considered at the planning/construction stage. In this example, the on/off switch is at the top of the left-hand vertical bar. All electric REJ Design towel rails are delivered with a plug connection. The length of the standard power cord is 1.3 m. The adjacent photo shows the Tango EH 35744 model with a left-top/right-bottom connection. The drying rack can also be installed so that the power cord and the on/off switch are in the right-bottom corner when viewed from the front.